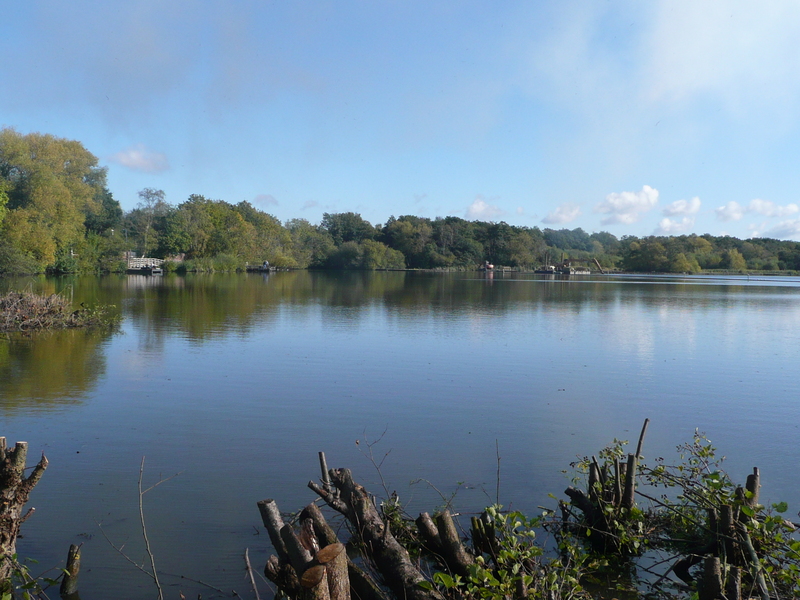 I came across an interesting article on the ‘Walks With Buggies‘ site (picture above) that features Fleet Pond Nature Reserve (select the Region Hampshire). The description of the walk is usefully detailed and the walk itself gets a 5 out of 5 rating! The site has been mentioned in The Sunday Times as well as BBC News. Walk to the end of this car park area and you will come to the road that you drove in on. Turn left and in front of you will see a trail marked with a red, blue and yellow post. Walk along here on a compact path and you will come to a large lake. In front of you is a viewing area. This is the start and end of this circular walk. You need to make sure you take note of this place or you could miss your turning back to the car park at the end of the walk. Turn right here and follow the yellow and blue trail, which is a walk around the lake. You will come to some steps on your left that leads up to the station. Walk past these and you will come to a small hump wooden bridge. This has a small lip on and off it. The article on the pond walk was written in 2007 and there have been numerous improvements to the accessibility of the pond since then, including better bridges. If you’ve taken a buggy around the pond recently, we’d be interested to hear your views (please leave a comment below). Picture credit: here (taken from the web site above). 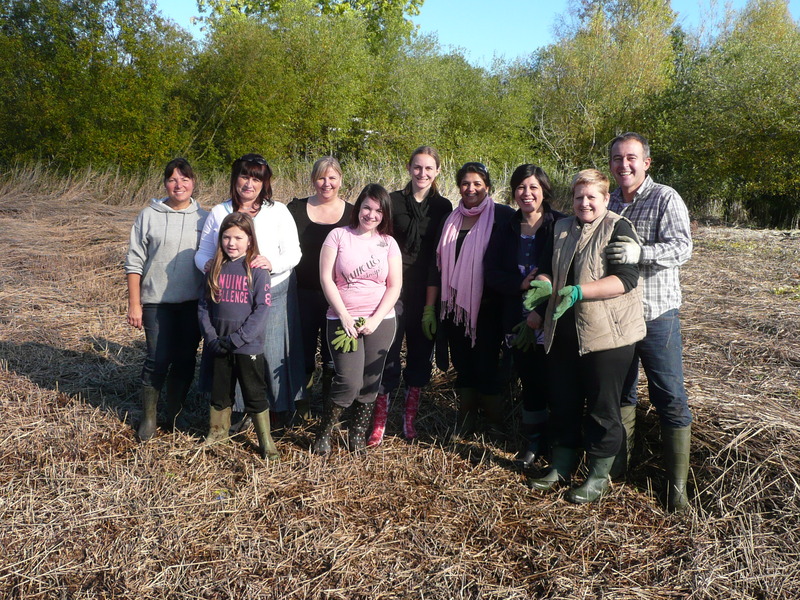 Debbie Stephens, our Branch Community Champion, had the good idea of organising an HSBC volunteer event at Fleet Pond. She contacted Colin Gray, Chairman of Fleet Pond Society, to progress this and HSBC were welcomed with open arms! 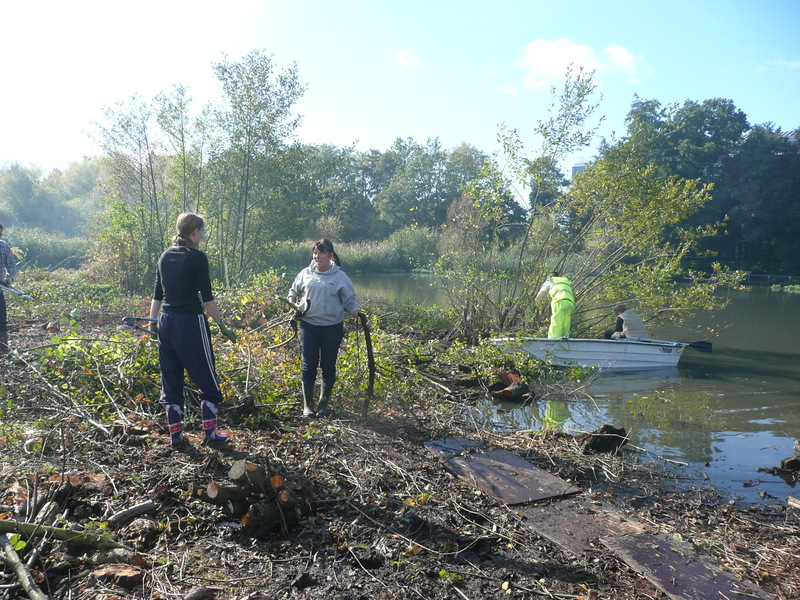 So it was that on a cold, frosty but beautifully blue-skied Sunday morning last October, a team of 10 HSBC volunteers took to the Pond to help out with the FPS conservation event for that day. All the HSBC staff very generously took the time out of their busy weekend schedules to join in but greatly enjoyed the event and there were smiles and laughs all round! This was the first such community project that the staff at Camberley have been involved in, and even though it was quite hard work, everyone had a really good time and were very satisfied with the final result. I’m very proud of my team and we’re all very glad that we’ve been able to make a positive difference to such a beautiful and natural location. I’d also like to say a massive thank-you to the people from FPS and to Rachel Jones from Hart Countryside Services for making our volunteering day such a big success. 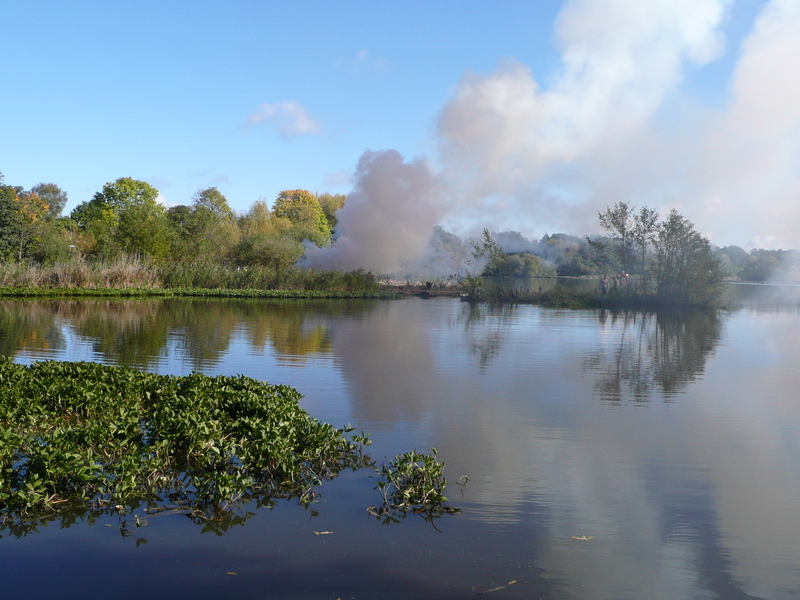 As you will have no doubt noticed, the next phase of the dredging to deepen Fleet Pond and island building to create more varied areas for the wildlife in and on the Pond has started in earnest. To check that the effects of the machinery working in the water and the inevitable disturbances are controlled and minimised, Johns Associates have been undertaking regular water quality testing, in addition to the routine monitoring carried out by the Environment Agency. Two “lucky” Fleet Pond Society members joined Becky Lemon from Johns Associates on one extremely sunny Sunday in September to complete initial water quality sampling for the latest Autumn 2012 works. Monitoring for the current works is on-going and results will be issued once completed and reviewed. Over the course of the Spring 2012 works, we sampled the water quality at least once a fortnight, taking with us two main pieces of kit. The first of these measures turbidity, which is the amount of light that can pass through a water sample; an indication of suspended particles. 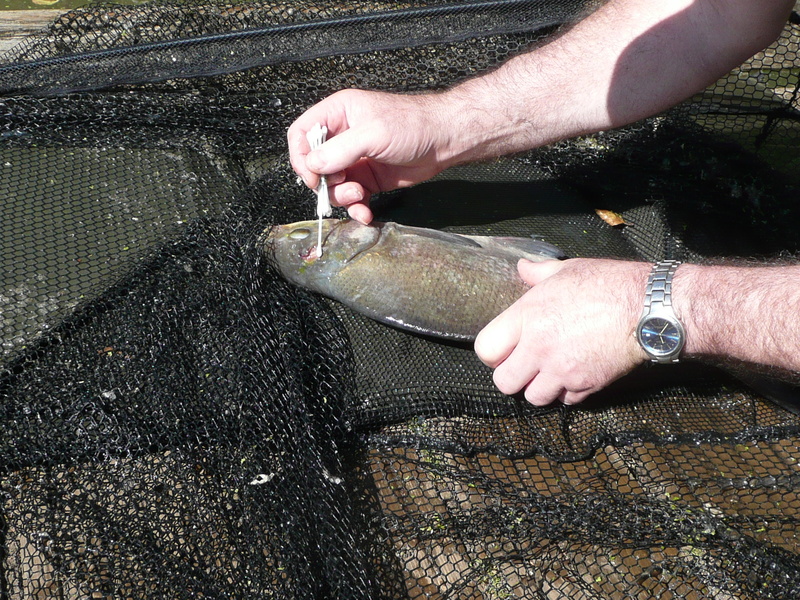 The second measures a large number of water quality factors including dissolved oxygen. The results showed that at much of the lake the turbidity remains low. The results from March 2012 show that the highest levels of turbidity in the lake were at site 13 on the north eastern margins of the lake (shown ringed in the map above), where works were taking place at this time. 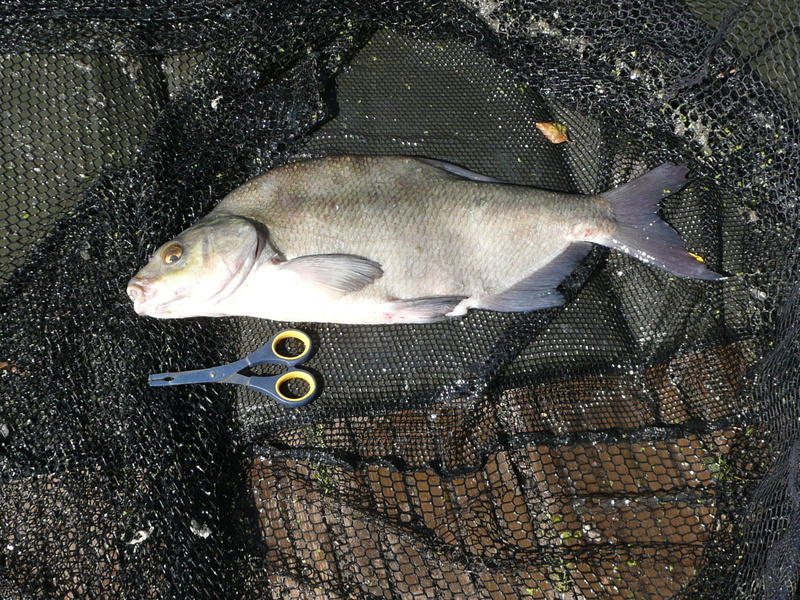 Despite these readings being high compared to normal levels, they were still below levels that would cause serious harm to fish (see Figure 2) unless maintained over a protracted length of time, measureable in weeks or months. They quickly returned to close to pre-works levels after the contractors left the lake in March 2012. 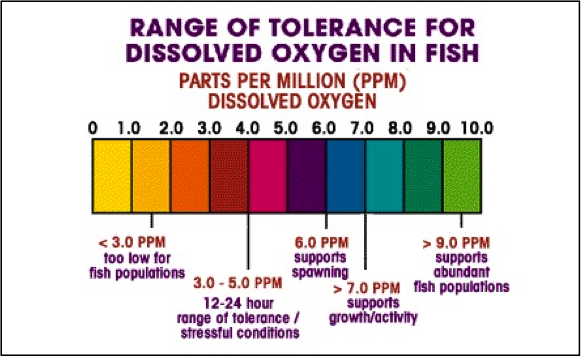 The other main indicator is the amount of dissolved oxygen in the lake water. 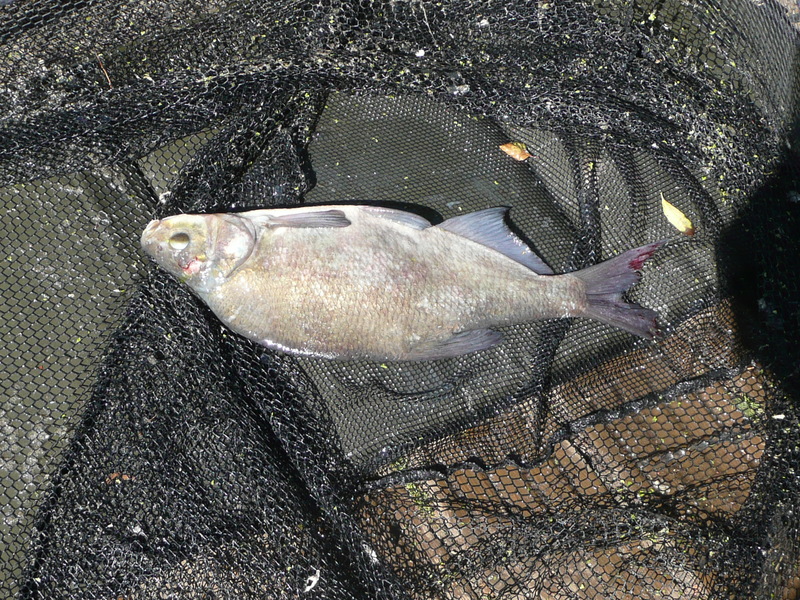 Figure 3 shows how levels of dissolved oxygen can affect fish in a lake. 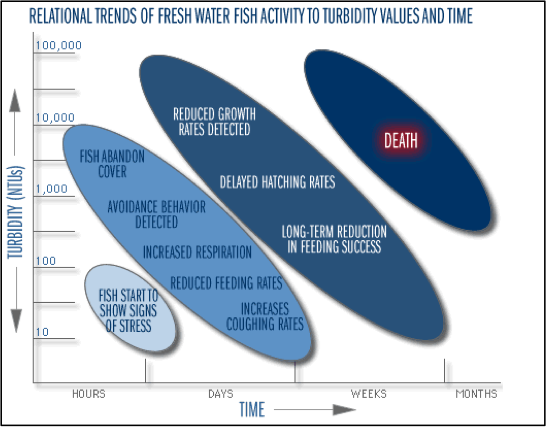 It is essential that this remains sufficiently high otherwise fish will start to suffer, and could result in fish deaths. The European Union’s Water Framework Directive (EU WFD) details maximum acceptable levels for this indicator: if the levels fall below this, further action, firstly in the form of additional or changes to the existing silt curtain, introduction of portable aeration and potentially a temporary stopping the works. The results from March 2012 show that all levels were high enough to support abundant fish populations, with even the lowest readings remaining above 9 parts per million (ppm). This is also firmly in the ‘Good’ category for the EU WFD. 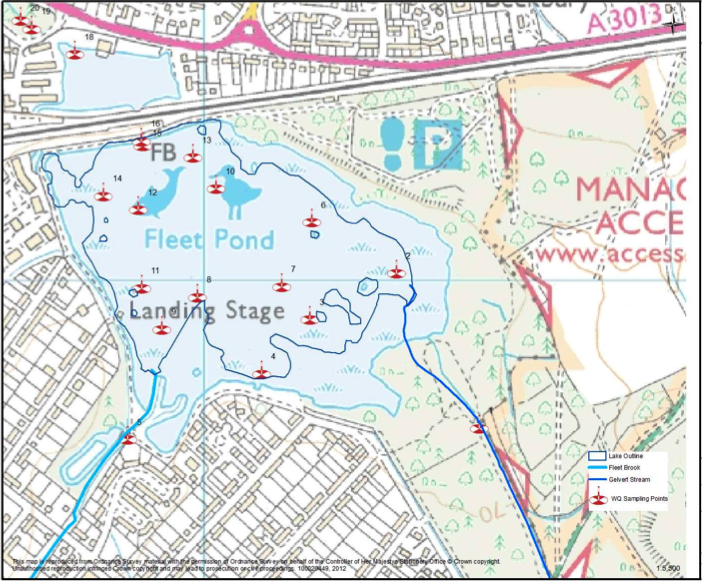 These indicators will continue to be monitored by the team throughout the programme of works, and any causes for concern will be reported to the site management, the Environment Agency and or other relevant organisations to ensure that the quality of water in Fleet Pond is maintained. Would You Like To Go On A Bird Walk in December? There will be two bird walks at Fleet Pond on Sunday 16 December, guided by local bird expert Peter Hutchins. Both are free to attend and newcomers are very welcome. The meeting place for both walks will be the car park on the north-eastern side of Fleet Pond (SU824553 OS Landranger map 186) – see here. “I’ll be taking the two groups on a walk about the pond, taking in the woodland and other flanking habitats, looking primarily for water and woodland birds with special attention being paid to winter visitors. Apart from the more expected species I’m hoping to locate, among others, Firecrest, Yellow-legged Gull, Mealy Redpoll and Water Rail, although not any of these are at all guaranteed! 07895 – 388378 or 01256 – 770831. For information and photos on previous (and very popular) bird walks at Fleet Pond lead by Peter, please see here and here. “I did a preview walk yesterday to check conditions for this Sunday’s conservation task. We will work up on the Dry Heath, close to the footpath that runs parallel to the railway line. 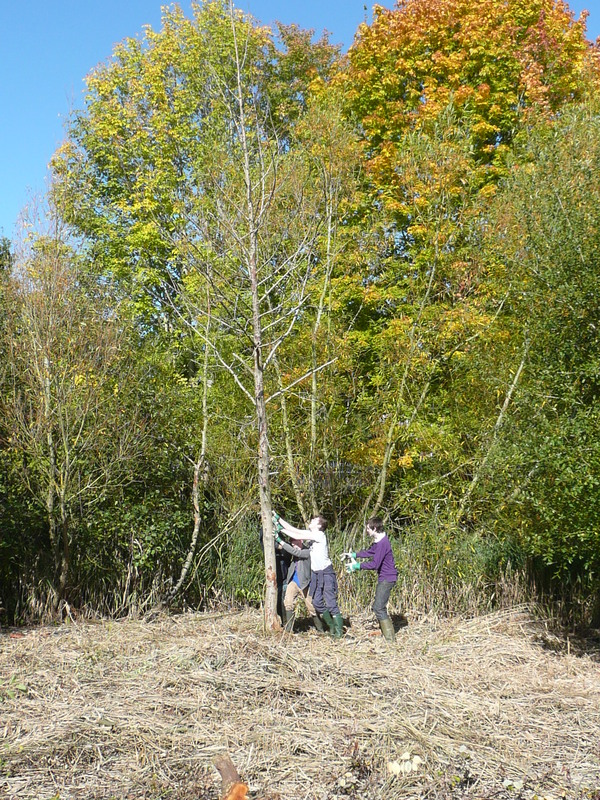 There are a lot of birch seedlings and saplings to be removed. We will be joined by a team from the Guides and also a team from Wildlife Explorers. Wellingtons should not be necessary but I recommend strong shoes! You can read about previous events involving the Guides here and Wildlife Explorers here. 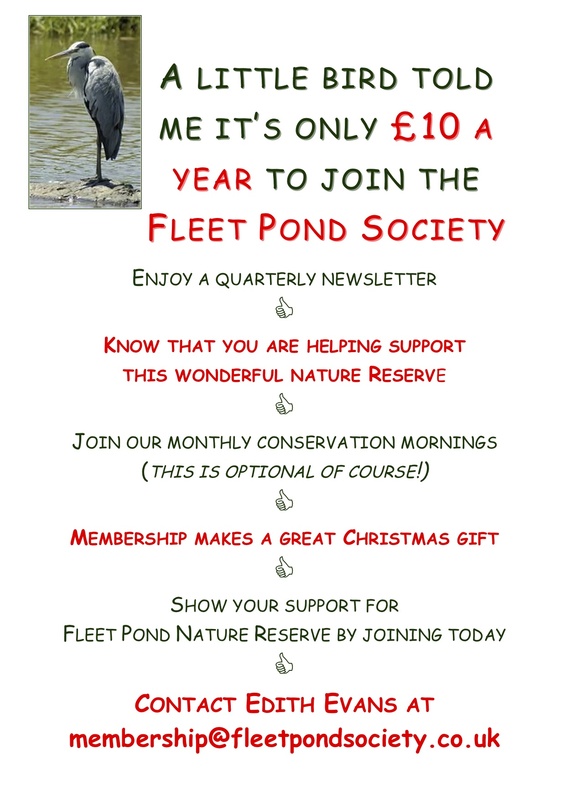 You are currently browsing the Fleet Pond Blog blog archives for November, 2012.